After months and months of hearing rave reviews from my Mom, a steak lover and steak connoisseur, I was finally able to join my parents for their Anniversary Dinner at Signature. As a loyal customer to both Ruth's Chris and Hy's, I was skeptical. But lo and behold, Signature lived up to its name. 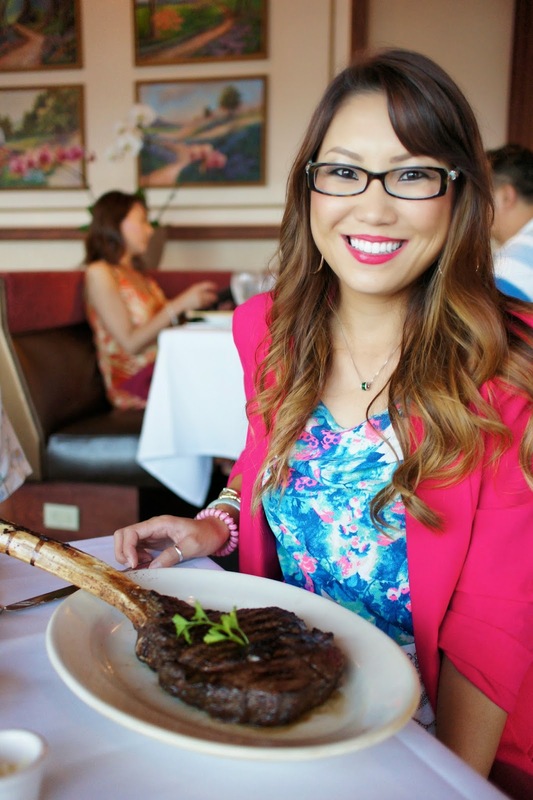 Mom ordered her usual New York Strip, while Dad and I shared the 28oz Wagyu Longbone!!! What an amazing cut the Longbone is- my pictures just don't do it justice. It is a large 28oz with the bone, and without the bone, 20oz of buttery, tender, melt-in-your-mouth meat that was perfectly cooked. After talking to the Manager, we learned that their steaks are wet-aged vs dry-aged. He told us dry-aged changes the taste of the meat, but wet-aged enhances the flavor of the meat. At the end of the meal, my parents and I were brought a generous slice of ultra chocolate-y 6 Layer Double Chocolate cake straight from Liliha Bakery in honor of their anniversary. I can't say enough about the steak, but then there's the side dishes that are just as exquisite. Don't want to brag or anything, but I didn't think any other restaurant's Brussel Sprouts could beat my own. I was wrong. I like my Brussels Sprouts to have light and crispy outer leaves, however Signature's was moist and salted up with little slices of bacon heaven. If I knew how delicious they were going to be, I would've had two orders of the Brussels! And don't think you need to order rice or a big baked potato, you will do just fine with their Truffle Mashed Potatoes that come with every entree. A great value, I must say. Mr. Peter Kim, the owner of Signature and many other restaurants that include Yummy's, Lahaina Chicken Co, and both Liliha Bakery locations, came by to say Hello to my Mom and Dad (as they are regulars there). Great guy! I can see how his determination, ambition and smarts has raised him to the level he's at as The Restauranteur. Can't wait to head back to Signature to try their Happy Hour menu and Spicy Bloody Mary aka BZT with Sriracha, Wasabi and a big crunchy Bacon strip! Not to mention, the views from the 36th floor of the Ala Moana hotel are breathtaking at Sunset. Highly recommend!! Wagyu Longbone! 28 oz of goodness!